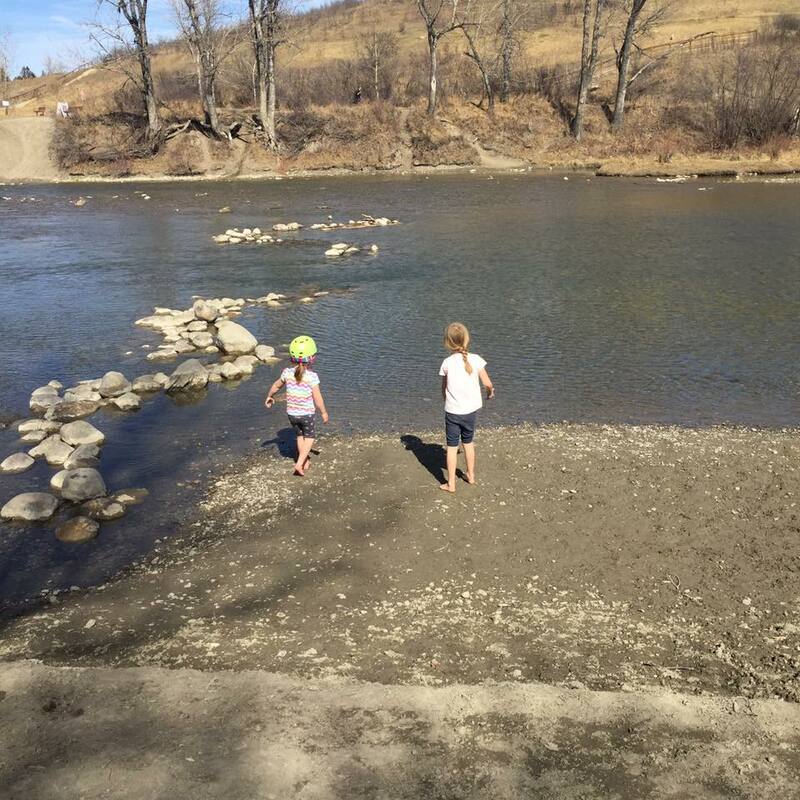 On Saturday, they were calling for crazy warm temperatures and we were wanting to do something fun. So we decided to go for a bike ride and get some Village Ice Cream. 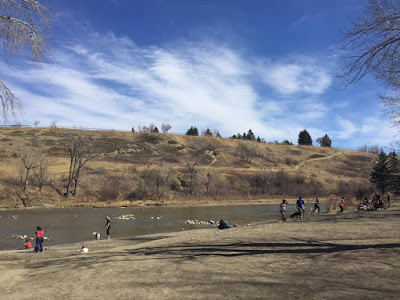 We did a similar bike ride last spring when we biked 35km from Bannister Road entrance at Fish Creek to Village downtown. Seeing as how this was the first big ride or any ride for that matter of the season, we decided that maybe we shouldn't be so adventurous at the get go. And I was worried that Greg's shoulder wouldn't survive a bike ride that long. 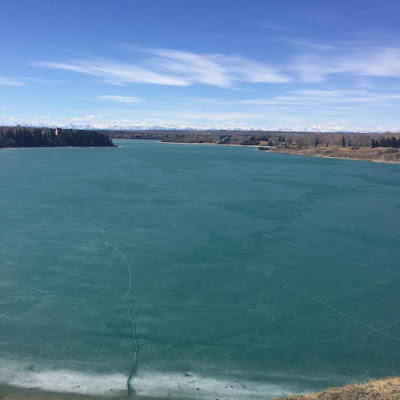 So after some google mapping, Greg suggested we drive to South Glenmore Park and ride from there to Village Ice Cream and back. We weren't sure how far it was km wise, but we knew it was going to be shorter then our previous one. It was an absolutely gorgeous day and the trails and paths were packed. People were walking, running, biking and picnicking everywhere. It was so great to see. The views along the ride are pretty spectacular and you don't even have to leave the city. 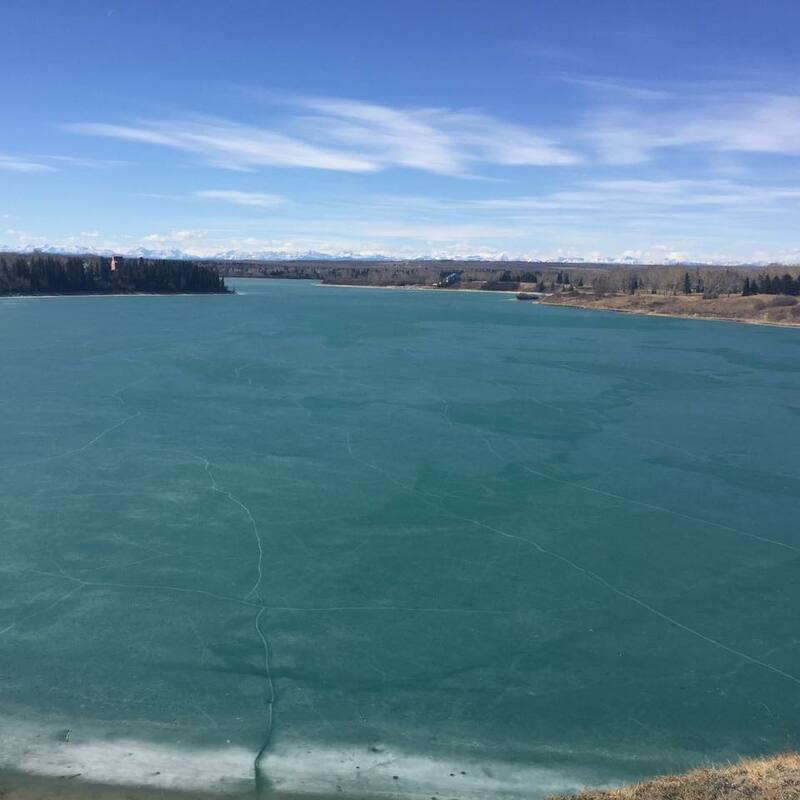 The coolest part was how the water was still frozen but you could see all the cracks in the water. Coming down a fun hill into Sandy Beach area. Trust me when I say that hill was not nearly as fun going back up. I was fooling around with my gears going back up and I went backwards and my gear was too hard and I lost all momentum and had to walk my bike up. I was so mad at myself haha. 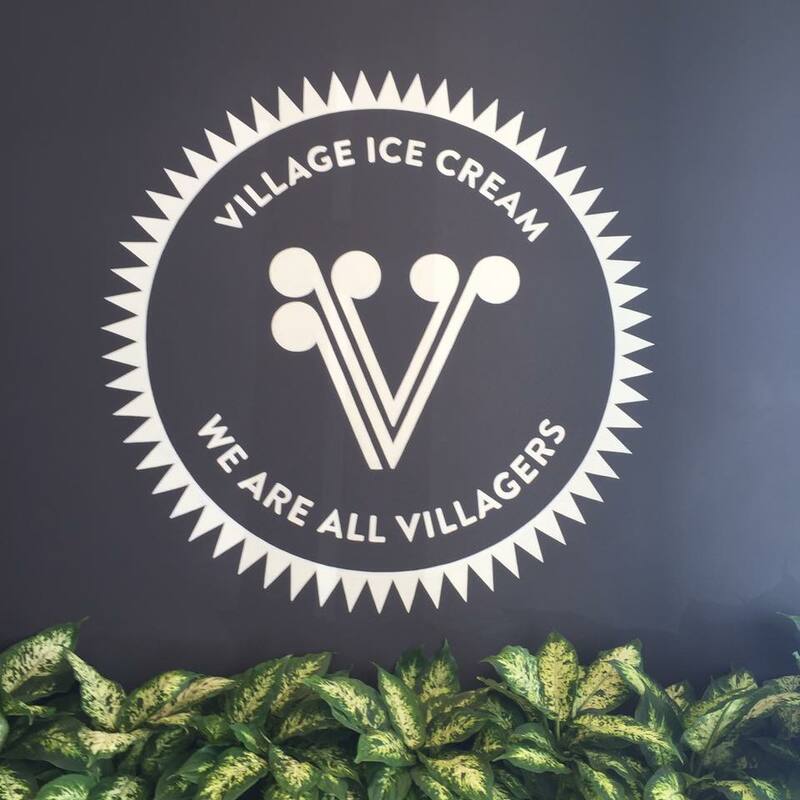 We finally made it to Village Ice Cream in Britannia and it was busy considering it was barely lunch time. And yes we had ice cream before lunch. Greg got the chocolate mocha mint chip and said it was delicious. The girls both got chocolate chip cookie dough which of course they both loved. I got salted caramel which I liked for about 3 spoonfuls and then I done. It was so rich it was making me sick. I tried trading with girls but neither was interested. I gave it to Greg to have and went got the earl grey ice cream. I almost always rotate between earl grey and toasted coconut but decided to be different today. They let you have all the samples you want so I am not sure why I didn't try it hahaha. You must check out Village Ice Cream if you haven't already. It is locally owned and made fresh in the store. The brother of the owner owns Buttermilk Waffles on 17th. They have 2 locations - East Village and Britannia and their third location opens on Friday in Garrison Green. They make their own waffle cones in store all the time so they are always fresh and you can buy pints to take home with you. We had to ride up this hill to get to 49th ave and the street that takes us to Village Ice Cream. You can kinda see the path in this photo. 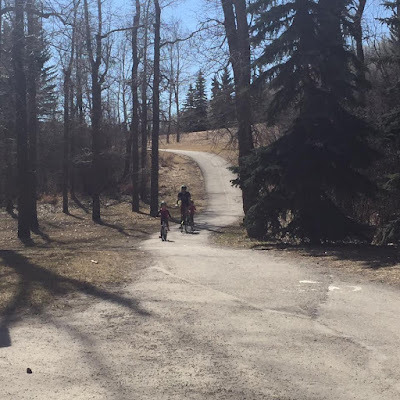 It was intense and awful and none of us had any interest in riding that hill back down so we detoured through Britannia and Riverdale Drive to get back. Lots of houses for rent and sale in those areas if you can afford it hahaha. 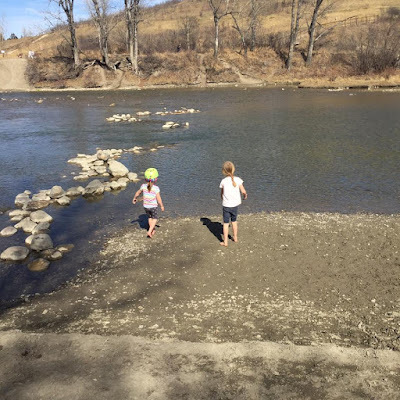 We stopped for lunch at Sandy Beach and we skipped rocks and the girls played in the water. It was initially shockingly cold for them but eventually they got used to it and didn't even notice the cold. The peace officers were there giving tickets to people with dogs. Apparently they have changed the laws and off leash areas and so they needed to enforce them. There was a dog that wouldn't leave us alone because we had food and the peace officers were coming over to either lecture us or give us a ticket but we told them it wasn't ours. It was kinda funny. I had never been here before and it is a great little area to spend an afternoon in the summer, I can't wait. Although I think I have either picked up or dropped off Greg and Jack here on one of their floating adventures. And speaking of floating, there were a few people in dingus floating along the river. It was still too cold for that imo. When we got home, Greg checked google maps and we biked 17km with a total elevation of 160m which is the equivalent of biking up Tunnel Mountain. While it was definitely shorter then the original bike ride to Village, it was definitely a lot tougher! !